. yamatsunami 山津波 "mountain Tsunami" landslide legends . 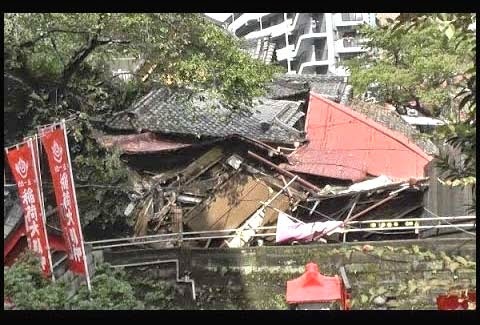 A 25-year-old Buddhist monk was confirmed dead on Oct. 7 after he was found under a collapsed hall of the Naritasan Yokohama Betsuin temple in Yokohama's Naka Ward that was hit by a landslide on Oct. 6.
. Yokohama Naritasan Temple 横浜成田山 . This statue had been lost in a landslide near a hot spring, and been found through a statement in the dream.
. Keishooji 桂昌寺 Keisho-Ji .
. Nariaiji 成相寺 Nariai-Ji . かりこ坊 Karikobo is venerated as 山の神 a deity of the Mountain. He likes to play tricks on people, especially imitating the sound in the forest like cutting a tree or causing a landslide or shooting a hunter's guns. But he never puts humans into real danger. When people hear him making strange sounds, it is best to keep quiet and pretend not to hear anything.
. kamioroshi, kami oroshi カミオロシ / 神おろし / 神降ろし "calling a Kami to earth" . A man wanted to venerate Yamanokami (Tonchibo) and had a shaman perform Kamioroshi. He was told Tonchibo wanted a toilet, electricity and a well. When he started to dig for a well, he found the bones of 大蛇 a huge serpent, maybe even 龍 a dragon. 630 years ago there had been a huge landslide and now the bones had been found. The man and his family were blessed from now on.
. Koojin sama 荒神様 Kojin Sama, Aragamisama . Once from the top of the mountain there came a stone falling down and smashed one serpent. Another serpent begun to call out in a loud voice and soon the riverbank collapses, a landslide happened and the mountain made violent noises. The blood of the snake still colors the stones along the river in red. there was a place in a valley where the woodworkers would come together to have a meal. "Something dangerous will happen soon, so please run away to safety as fast as you can." 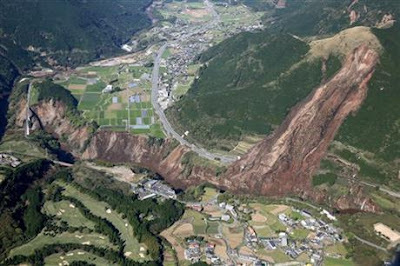 Some of the woodcutters took it serious and run away, others kept sitting there munching their rice and the - - - a huge landslide came over them and swept everything down the valley. They think it was 山の神様の知らせ the Deity of the Mountain who came to warn them.
. Kumamoto April 2016 熊本地震 .
. Jizoo Bon 地蔵盆 Jizo Bon Ritual .